Wrapped and ready to give at 30% OFF! 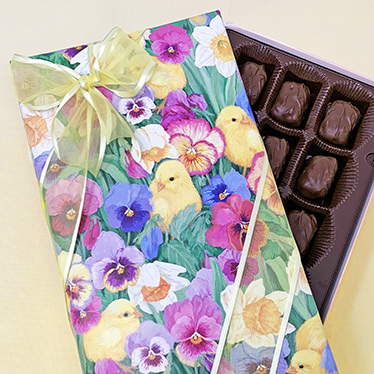 We wrapped our delicious 8-oz Fruit Chocolates with some adorable spring gift wrap, tied it up with a shear yellow ribbon, and then dropped the price by 30%! This limited supply item will make your spring and Easter gift-giving easy for you and even more special for your gift recipients! They'll get our classic fruit & nut candies dipped in our premium blend of creamy milk and flavorful dark chocolate for a richly satisfying confection. 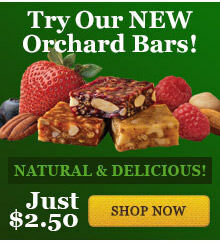 Includes: Strawberry-Walnut, Cherry-Pecan, Raspberry-Pecan, Orange Marmalade, and Apricot-Walnut flavors. Kosher. INGREDIENTS: sugar, corn syrup, nutmeats (walnuts, pecans), chocolates liquor, cocoa butter, milk, modified corn starch, pectin (pectin, disodium diphosphate, sodium polyphosphate, dextrose, dicalcium phosphate), candied orange peel, (orange peel, sugar, citric acid), dried apricots (contains sulfur dioxide to retain color), dried cherries (cherries, sugar, sunflower oil), butter oil, natural flavors, soy lecithin, fruit juice from concentrate (strawberry, raspberry, apricot, cherry), sodium citrate, citric acid, malic acid.